“In the case of our super-mighty preemptive strike being launched, it will completely and immediately wipe out not only U.S. imperialists’ invasion forces in South Korea and its surrounding areas but the U.S. mainland and reduce them to ashes,” wrote the Rodong Sinmun newspaper. Also, the North Koreans are characteristically incensed by the current round of U.S.-South Korean military exercises, an aerial training program called “Max Thunder,” which is scheduled to run through April 28. 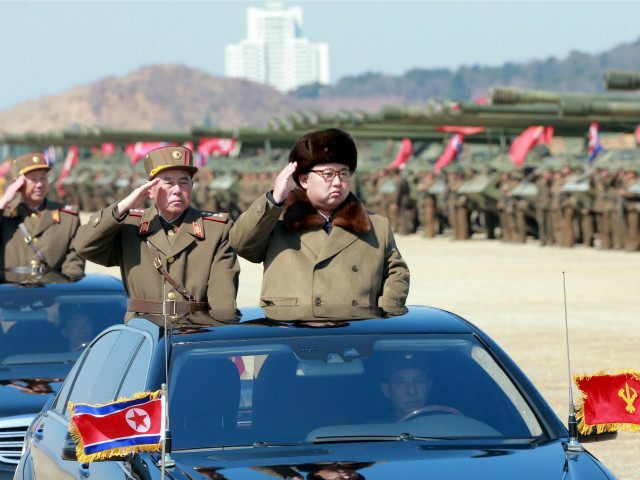 North Korea always denounces training exercises involving America, South Korea, and other allies, portraying them as practice sessions for a full-scale invasion and sometimes even as the first stage of an invasion disguised as a training exercise. Pyongyang’s rhetoric might be as barbaric as ever, but its actions suggest pressure from the U.S. and China has forced the Kim regime to back away from further provocations, at least temporarily. The analysts who were concerned about an imminent nuclear test at the Punggye-ri test site, timed to coincide with last weekend’s North Korean state holiday celebrations, now report satellite imagery that shows several volleyball games being played at the site. Three volleyball courts are up and running, with a fourth apparently under construction. The analysts at watchdog group 38 North note that the volleyball games could be a deception, and the site remains capable of conducting a nuclear test at any time. Russia has also moved troops and military equipment to the North Korean border, possibly to prepare for a wave of refugees after military hostilities or the collapse of the Kim regime.